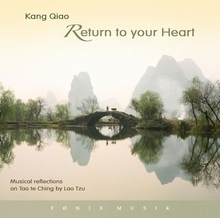 Taiwanese master musician and composer, Kang Qiao, has recorded this beautiful album using traditional Chinese and western classical instruments. The greatest image is invisible, for it is the world itself. The greatest sound is unspeakable, for it is nature itself. This is Lao Tzu's wisdom of Tao - the law of nature. Let yourself flow into the sound of Tao. Let it be. Let yourself return to your heart.